Fall has finally arrived with a bang. The first storm of the season blew in the other day. 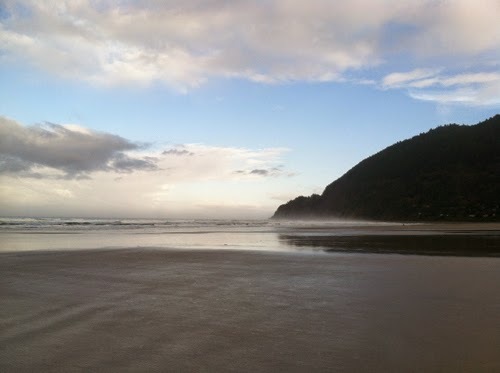 It has been way too long since we have seen a good rain here on the Northern Oregon Coast. For a place renown for its rainy gray climate, it has been a bit spooky. The upside of all the sunshine is that I have taken advantage of every moment I could to get out to paint. I have neglected quite a few things in the process. I have also taken advantage of these rainy days to work on correcting my discovery that this challenge has unearthed. To refresh the memory, I discovered at the beginning of this challenge that I did not have my life organized to focus on art full time. It was a bit of an eyeopener to me. I am correcting that this month. It has not been an easy process for me but little by little I am making progress. I have using the time spent inside due to the stormy weather to get a few basic life systems in place to free up more time. One of these is food and cooking. Good healthy food to nourish the mind and body without taking too much time away from the day. Being organized is not exactly a natural state for me but I have seen the necessity for it. It hasn't been all chores and organizing though! I have also been putting in time for study, sketching, and building my drawing skills. 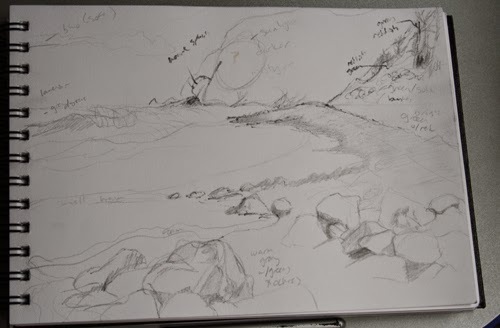 This morning during my morning walk I took my sketchbook and spent a bit of time sketching out an idea for a painting. Here is the sketch even though it is more of a road map rather than picture book. It is the beginning step of this piece. I am taking this painting through a deliberate process. I will be elaborating on the process and painting in a future post. 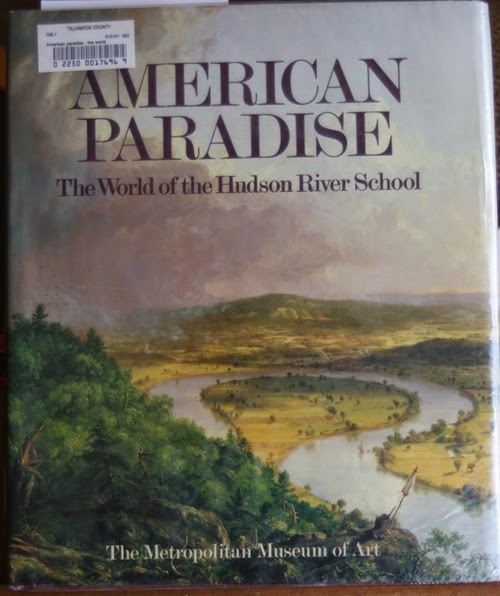 I have been studying the Hudson River School painters. I have always loved Luminism style of painting that this particular group of painters were known for. The landscapes they painted were majestic and rather romanticized. I don't feel called to paint in exactly the same manner but would like to get my colors as luminous as theirs and some of the detail. It is their art process that I find particularly interesting. At the moment, I am reading these two books that I got from our library system. The first book is the older of the two. The pictures aren't as nice but I am finding the text more informative. 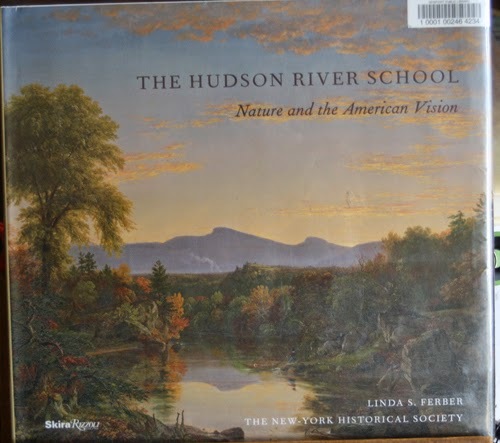 There is a section on each of the Hudson River School painters along with associated works. The second book has stunning pictures but doesn't delve into each artist in depth. I am learning a lot about how these artists worked from the first book. Since I left school I have been busy not only teaching myself how to paint but how to paint en plein aire. It has been a struggle at times, but I am always wanting more! I have neglected my drawing and sketching a bit but not entirely. I need to bring that back into balance and push my drawing skills further. This month I have been remedying that. It doesn't make for interesting blogging at this point but I will talk about it more in the future. Saturday is forcasted to be partially sunny. I plan to get out and paint if the conditions allow. More on the above topics to come!